New Bern, NC, January 7, 2019 – Coastal Carolina Regional Airport (EWN) contributes $362 million annually to Eastern North Carolina’s local economy, supports 2,125 jobs, and provides approximately $12 million in state and local taxes, based on a report released Monday by the NC Department of Transportation’s Division of Aviation. North Carolina’s publicly owned airports contribute more than $52 billion to the state’s economy and support 307,000 jobs. The report highlights the economic impacts of the state’s public airports and the related aviation and aerospace assets that support North Carolina’s aviation economy. NC Department of Transportation (NCDOT) created the report to help guide future investment in aviation infrastructure and to act as a tool for recruiting future aviation and aerospace industry. Impacts are calculated based on factors such as jobs supported by the airports and the businesses that rely on them, business and leisure travelers, and airport capital projects and operations. “Our network of 72 public airports, and the aviation and aerospace assets that rely on them, help move our economy forward by creating jobs, supporting business growth and connecting people and companies to markets around the globe,” said Bobby Walston, director of NCDOT’s Division of Aviation. Specific details for the economic contribution will be available later this month. View the full report, including the breakdown of each individual airport’s contributions, at ncdot.gov/aviation. 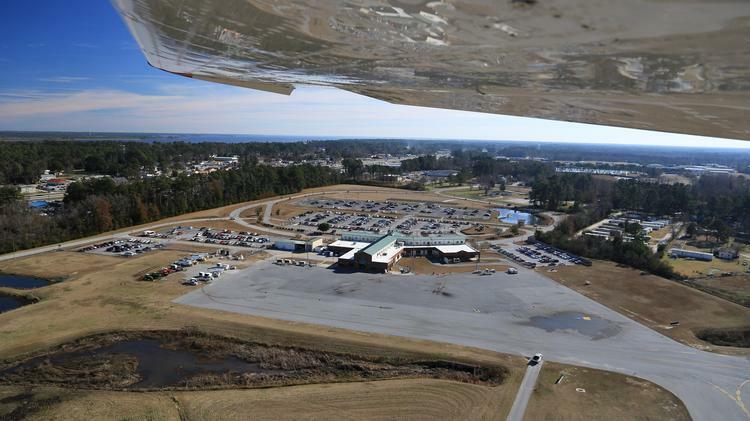 NEW BERN, Craven County — The Coastal Carolina Regional Airport is already a busy one. It’s about to get busier. With nearly a quarter million passengers a year, the airport is a fast-growing location that is in the middle of some growing pains. So the airport is using $5.1 million from the FAA to expand its apron. Plans are to break ground on the project in early fall with the apron completed before Christmas. The apron, also known as the ramp, is where the planes park and let people on and off. The one at the New Bern airport has not seen improvements in 20 years. “So we’ve already re-patched this place twice so that’s why now with the larger airplanes and the heavier airplanes we’ve got to go from asphalt to concrete for the entire ramp so that will be a huge improvement,” Shorter said. The expanded apron also allows for the possibility of more planes coming to the airport that will fly to more destinations. With airlines like Delta and American no longer buying small planes, the need to make the changes is even more important. Shorter said more than 62,000 square feet will be added to the apron, a major undertaking. “Certainly in the future, with the longer airplanes that might have longer legs, if we could get legs to other hubs, say Dallas, Charlotte, say Dulles up in the Washington D.C. area, you know that is ultimately a goal for us,” Shorter said. “All airports are always looking for more and better destinations. Shorter said the expansion will eventually include a bigger terminal, more TSA screenings and ultimately putting some more counter space. “It’s going to be a busy time, but good busy is always nice to have,” Shorter said. As commercial airlines shift focus to larger jets, it presents a conundrum for smaller airports – one federal funds might help solve for a tiny, regional airfield near the North Carolina coast. In New Bern, Coastal Carolina Regional Airport has been quietly serving both Delta Airlines and American Airlines for more than a decade, says its director, Andy Shorter. And it’s doing it from a 40,000-square-foot terminal. Small jets, many of them 50-seaters, land at the airport, taking eastern North Carolinians on quick jaunts to Charlotte and Atlanta where they can then connect to destinations throughout the globe. But, as Joe Esposito, senior vice president of network planning at Delta, told a crowd last week at the Regional Transportation Alliance 2018 Transportation Breakfast, the airline is moving to larger jets. While Delta used to have 500 of its 50-seaters, it’s now down to 120 “and shrinking,” Esposito said. “Buying smaller airplanes is not necessarily where Delta wants to be,” Esposito told the crowd last week. Shorter says it’s a shift his team has seen coming, which is why it’s elated to win a new $3.9 million FAA grant for “the first transformational project we’ve had in a long time,” an apron expansion. An apron is where airplanes park to load and unload passengers and cargo. A look at the apron being expanded and rehabilitated at Coastal Carolina Regional. By using some of the cash to swap the ramp’s asphalt for concrete, it will be able to handle a heavier weight, too. And that’s all just the first phase of what’s coming. Phases 2, 3, and 4 coming to the New Bern airport will expand the terminal by another 5,000 feet, increase how many people it can hold and provide more area for enhanced TSA screening. In order to attract more growth, investments are essential, he says. He envisions a Coastal Carolina that can one day fly nonstop to other hubs such as Chicago and Washington, D.C. Right now, 70 percent of the airport’s traffic is general aviation, with commercial traffic from Delta and American accounting for the other 30 percent. The airport sees “about a quarter million commercial passengers” each year, and just over 40,000 operations. State funds are already being used for general aviation projects, such as new hangar space that could lure more companies to eastern North Carolina. Business View Magazine interviews Andy Shorter, Airport Director at the Coastal Carolina Regional Airport, as part of our series on American regional airports. Coastal Carolina Regional Airport (EWN) is a public-use airport located three miles southeast of downtown New Bern, in Craven County, North Carolina. The 785-acre facility is a full-service airport that supports both commercial and general aviation. EWN has an interesting history as it was founded in 1931 before World War II. Many airports across the nation were founded during World War II where the local communities took those assets over from the government at the end of the war. It is interesting to note that there was enough foresight in this area to go ahead and start the development of an airport in Eastern North Carolina well before the war years. Simmons-Nott came from North Carolina Senator Furnifold McLendel Simmons who was present at the 1931 dedication of the new facility that was to bear his name. During an air performance for the dedication, United States Marine Corps First Lieutenant Joel Nott was killed. Senator Simmons required that 1stLt Nott’s named be added to the airport to pay homage for the fallen military officer. After the start of World War II, the Airport served as a Marine Corps Air Station for several years, before a permanent base was opened nearby and the facility reverted back to civilian control. The Simmons-Nott designation was retained initially, but eventually the name was changed to Craven County Regional Airport, and then, about 10 years ago, it was modified to Coastal Carolina Regional Airport to embrace the surrounding counties and be reflective of the general area the facility serves. Since its opening, EWN has seen many changes, including runway extensions to accommodate larger aircraft, the addition of hangars, and a new commercial passenger terminal that was constructed on a new site in 1999. In 2008 the Airport’s new general aviation terminal was built thereby completing the modernization of both airport terminal facilities. About 50 percent of Airport traffic is business-related, a portion of it due to the Marine Corps Air Station Cherry Point, which is 12 miles away. Leisure travel is responsible for the remaining 50 percent, thanks to New Bern’s location near the beaches of North Carolina’s Crystal Coast. New Bern and the surrounding area have become increasingly popular as a place to live, including for significant numbers of retirees who use the Airport to fly commercially or have privately owned planes, Shorter adds. EWN is also home to a 42,000-square-foot FedEx cargo terminal that Shorter estimates does about half its business with the Marine Corps base. A majority of businesses on the Airport’s grounds are aeronautical-related, but work has begun on a project aimed at broadening that scope by developing a 25-acre site, specifically, for non-aeronautical businesses. “We are looking to expand commercial development into an airport area that is not conducive to aeronautical uses, so we’re kind of dipping our toe into that water now,” explains Shorter. 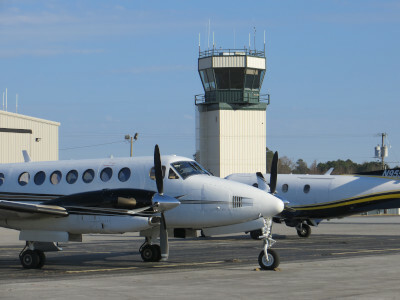 EWN is one of North Carolina’s 10 commercial service airports and Shorter says it is self-sufficient; requiring no general funding from the city or county. 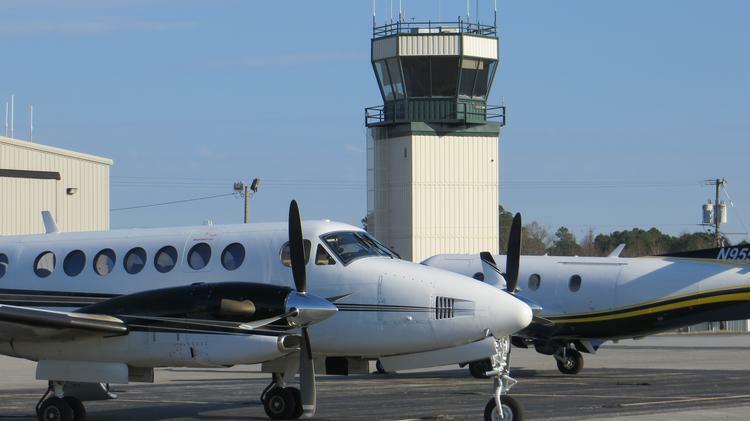 “We get some valuable support from Craven County including Finance and IT, but we budget our own money and reinvest those assets to keep all the pieces of the airport economic engine running smoothly,” he states. Shorter remarks that as a primary, commercial, non-hub airport, Coastal Carolina Regional Airport receives annual capital improvement funding from the FAA of about $1.3 million per year, as well as a portion of the funds the State of North Carolina has recently provided to the 10 commercial airports. He describes the Airport as a “hybrid” because of the strong general aviation and commercial traffic and he credits that fact as the key element of the facility’s local impact. EWN has 45 employees and according to Shorter, the Airport’s most recent economic impact survey shows it supports 180 direct jobs and another 380 indirect positions in the area. “Our airport, in 2016, had a $179 million annual impact,” he adds. “That puts us 13th in the state out of 72 airports.” The aircraft hangars are completely full and there is a waiting list, putting new hangar development high on the Airport’s wish list. Join us for Emerald Isle Flavor 2018, the premier NC Brew and Food Festival event on the Crystal Coast. Sample a variety of craft beers including IPA, Pale Ales, Pilsners, Stouts, Lagers and more made by local North Carolina craft breweries or some of the great wine from local vineyards. And tempt your taste buds with delectable seafood dishes created by chefs from the finest Southern Outer Banks area restaurants. Entertainment for the weekend includes performances from a variety of artists. So come relax and enjoy a fabulous oceanside weekend of food and fun in Emerald Isle! Experience fundraising a different way in New Bern with live music, silent auctions and everyone dancing the night away in the heart of downtown. Autumn Affair will have the popular band, Limited Engagement for you to dance the night away! You can also bid on dozens of items including overnight getaways, gift certificates, paintings, boat rides and so much more! Autumn Affair brings our community together for Boys & Girls Clubs of the Coastal Plain, a nonprofit organization whose mission is to enable all young people, especially those that need us most, to reach their full potential as responsible, productive and caring citizens. 100% of proceeds go directly to New Bern and Havelock Clubs.